When I moved to my current property eight years ago, the house sat on half an acre of adobe clay, punctuated here and there with construction rubble and overgrown with tumbleweeds. There was one pitiful trashy elm about 20 feet high, and nothing else. After putting a fence around the perimeter, my next project was to put in some trees. 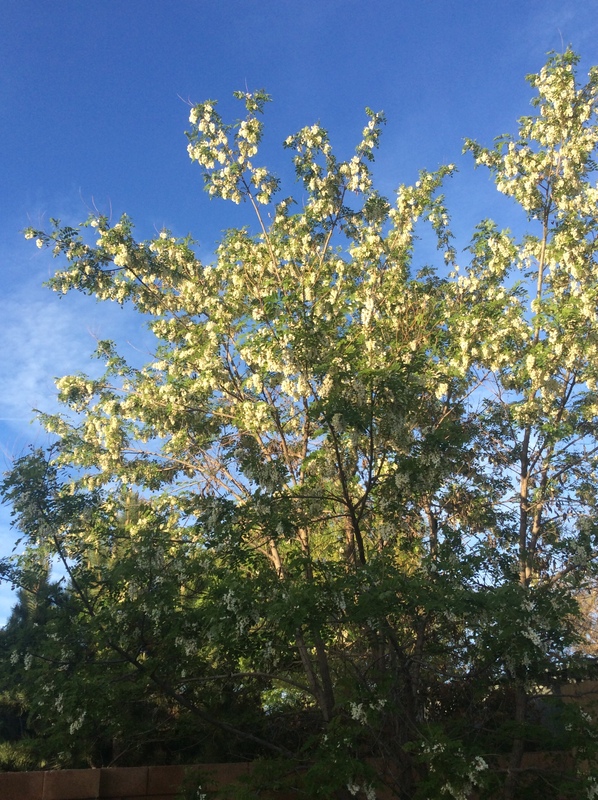 Mostly I chose fruit trees, along with one almond tree, but I left one back corner for a black locust, Robinia pseudoacacia, which may be my favorite tree. It is fiercely thorny, toxic except for the blossoms, suckers badly, and tends to shed limbs disconcertingly and hazardously as it gets older. But for a week in April it is glorious beyond belief, covered with white flowers, casting the scent of lilies for hundreds of feet around, and so filled with bees that the entire tree hums. I hope never to be without a black locust again. It also fixes nitrogen, which may benefit my soil, but its main advantage the rest of the growing season is that it casts perfect lacy shade for growing plants that can’t tolerate the desert sun. Now that I have some light shade to work with, I’m finally able to grow milkweed and oca and groundnuts (apios) and cow parsnip and a number of other plants that used to shrivel and die as soon as the first hot days hit. 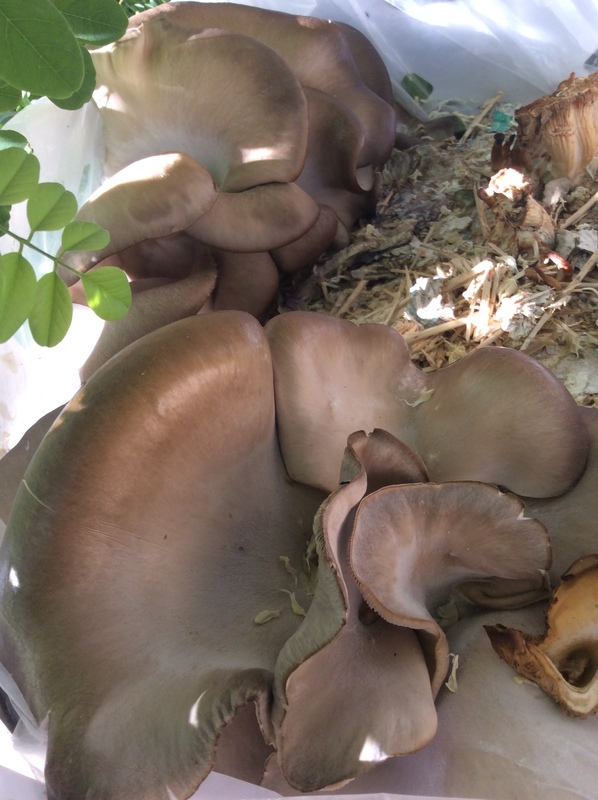 I have never had any luck growing mushrooms outdoors here, but I’m trying again in the shade of the black locust, and the results are wonderful. The blossoms of black locust are nice on salads, and can be battered and fried, but deep frying is one kind of cooking that I don’t go in for, so I don’t know much about it. The rest of the plant is toxic. My goat got out once and ate some without apparent harm, but that may have been luck. So try to site it away from livestock and in an area where a falling limb as it ages won’t be a disaster. So wonderful to hear the back story about your yard. Very smart to put a fence up. I keep planting windbreak plants, but am considering building some walls on my site because it is just so exposed and wind really has an enormous effect on plants. The mushroom picture says it all -so good! Our springs are punctuated by fierce windstorms that can go on for a day and include gusts to 50 or 60 mph that dessicate plants as if they had been blow-dried. So wind protection is paramount here. It probably goes without saying that such weather makes the use of a tree prone to brittle limbs fairly stupid. But I love my black locust anyway. Oh, my. And I thought wind here could have bad effect! I should add that windstorms that bad are rare, coming only once or twice a spring, but less severe ones are common in the spring. So yes, we’re preeminent in the dry-rapidly-moving-air department. On the other hand, we’re pretty safe from tsunamis here and we don’t have large alligators, so maybe it balances out.